Over the summer, I took the time to read Barbara Kingsolver’s Animal, Vegetable, Miracle. It was the height of gardening season, we’d just acquired our first round of chickens, and I was completely enamored of her stories of sustainability and year-round local eating. Of course I was – our garden was overflowing with tomatoes and beans and peppers, and there was local produce to be had at farmers markets and roadside stands everywhere I turned. Even the chain grocers carried local and regional fruits and vegetables, and proclaimed it proudly with prominent signage. When fall rolled around, I even planted a “winter garden” full of a variety of cruciferous vegetables – cabbages and brussels sprouts and broccoli and greens – along with tender lettuces and spinach. Unfortunately, the brassicae were more fodder for a host of Mamestra brassicae (cabbage moths and their larvae) than they were for our family. We managed to eke out a few small heads of broccoli and some collard greens, but for the most part the chickens enjoyed the leafy treats crawling with juicy caterpillars. Our lettuces did well, though. About four weeks ago, the Marketing Team Leader at Harry’s Farmer’s Market (with whom I’m partnering on the pantry stock-up giveaway – if you haven’t already entered, there’s still time!) announced on their facebook page that they were working with Rockin’ S Farms to put together a Community Supported Agriculture subscription program. I was so excited to hear this – I’d read about Rockin’ S on Jenn Carter’s A Hundred Miles of Food blog, and was intrigued by this little farm located about 14 miles northeast of my house. They grow their own corn for meal and grits, and grind it on their property. They also make jams and jellies, and are known for their chow-chow. I immediately decided that I would give their CSA program a chance. I even had a chance to meet Nichelle Stewart, one of the owners, and her family at Harry’s one day when I went in to pick up my produce. 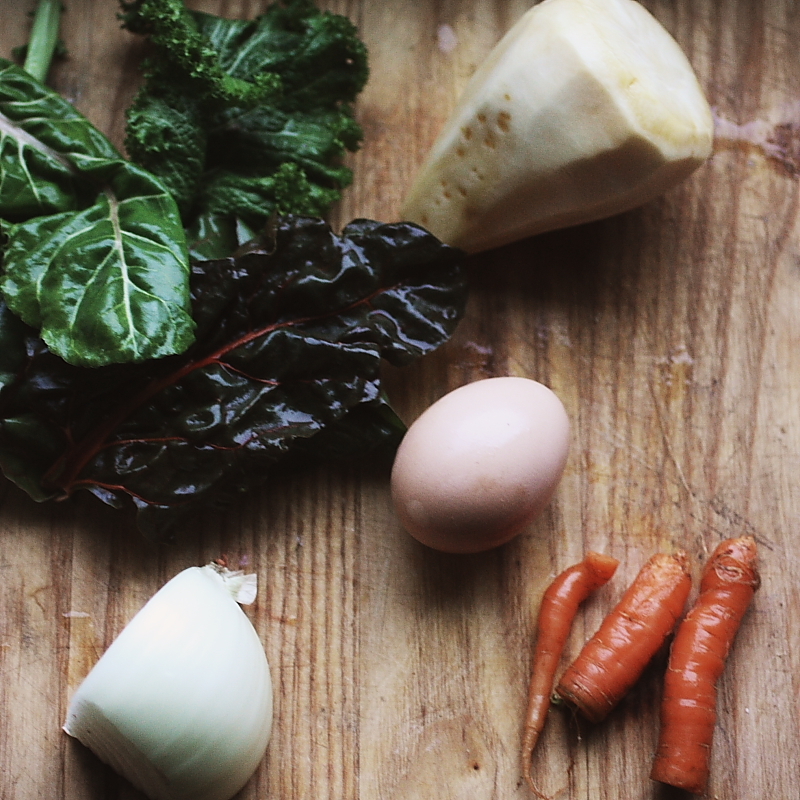 The thing about eating locally year round is that winter can be a tough time for produce. Luckily, here in Georgia we’ve had a very mild winter so far, which means our winter growing season has been extended. However, winter vegetables are very different from what we’re used to in the spring and summer. Instead of brightly colored summer squashes, peppers and tomatoes, we’re talking about root vegetables, leafy greens and densely packed heads of cabbage. As far as fruits go, you might still be able to get some varieties of apples, persimmons, pears and pomegranates. And since we’re close to Florida, citrus is always an option. Our bags from Rockin S’ are always chock full of picked-fresh (usually the morning of the day they are delivered) greens and root vegetables. We’re also privy to bags of corn meal and grits, as well as shiny jars of preserves. One week we even got honey from a local bee keeper. 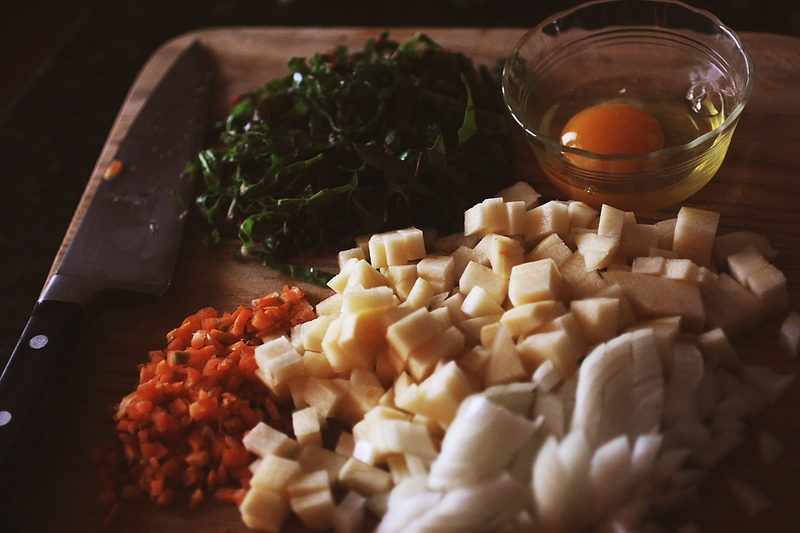 I’ve had a great time coming up with new and interesting ways to incorporate these vegetables into our meal routine. Yesterday, I had a comment on my facebook page from a fellow CSA subsriber. I had mentioned using rutabagas from our bags one week to make dinner for our family. She said she was a little inexperienced with some of these veggies, and asked for more info on how we used the rutabagas. 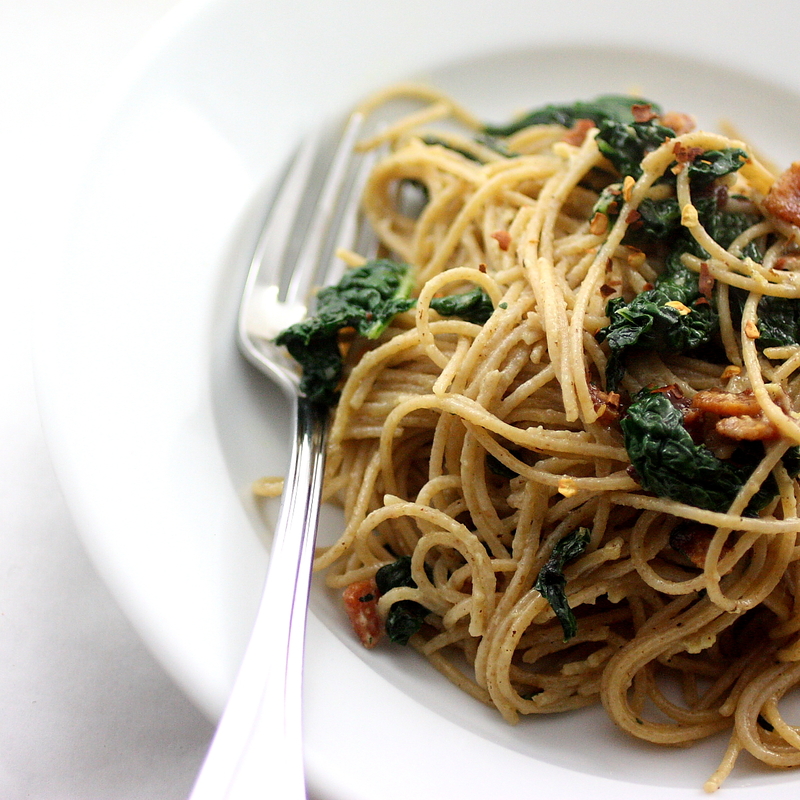 It occurred to me that there might be more people out there with similar questions (Nichelle Stewart from Rockin’ S does a great job of including recipes and information in the bags each week, by the way), so I decided to do a post recapping some of the ways we’ve put this bounty to good use, including the Kale Carbonara pictured above. 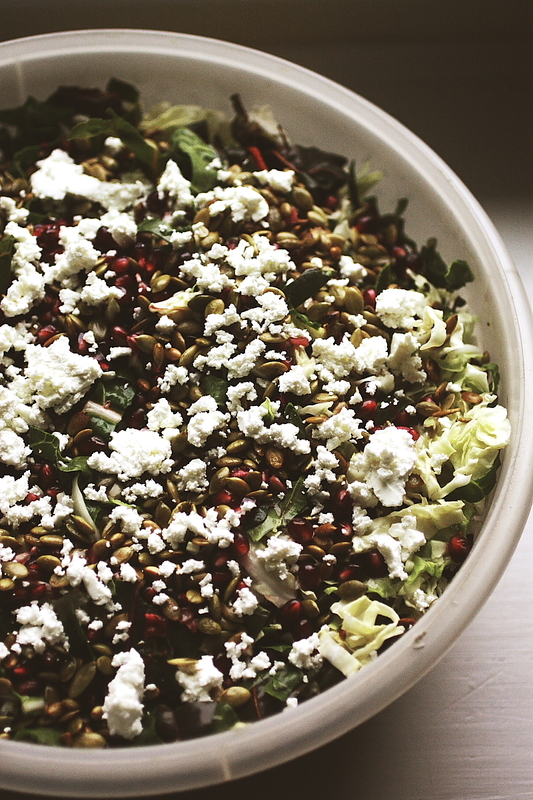 This salad with greens, pomegranate arals, pumpkin seeds and goat cheese is based on one that Tami of Running with Tweezers featured a couple of weeks ago. I shredded up some napa cabbage and colorful rainbow chard from one of our bag one week, and subbed chevre and pumpkins seeds for Tami’s pine nuts and aged goat cheese. It was a huge hit at a dinner party we went to, and I’ve been making variations on it ever since. 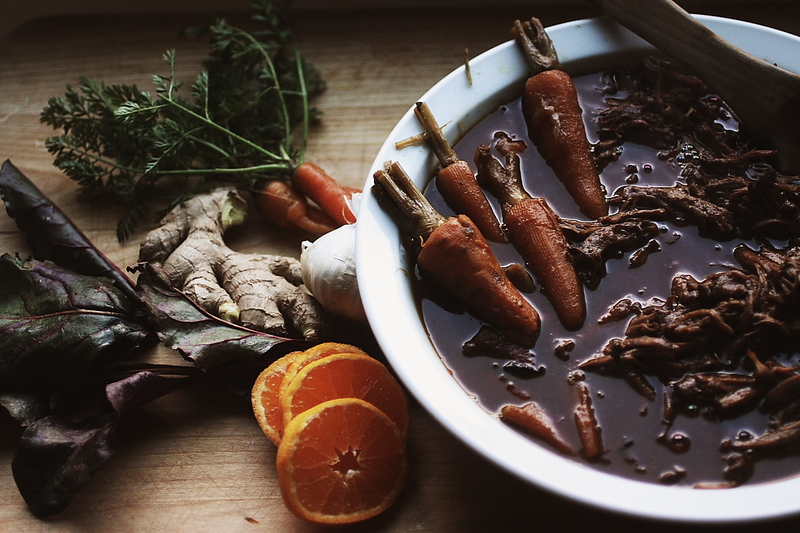 This Asian-style beef stew is loosely based on this recipe for pot roast from Whole Foods. I used carrots, beets and rutabagas as the vegetables in the pot and added some orange zest to brighten things up a bit. It was delicious. 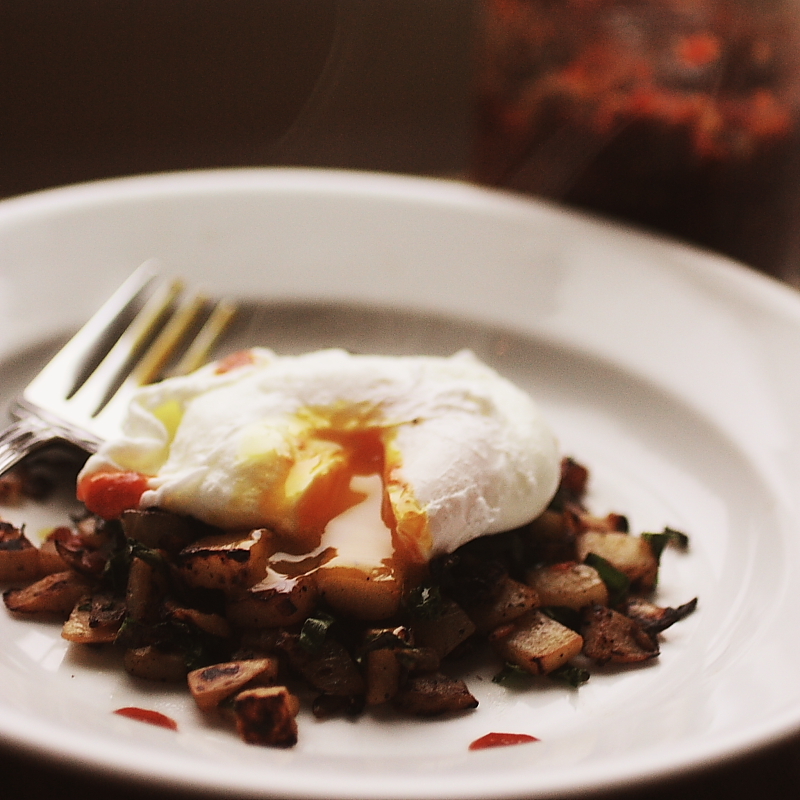 Begin by melting the coconut oil in an iron skillet over medium-high heat. 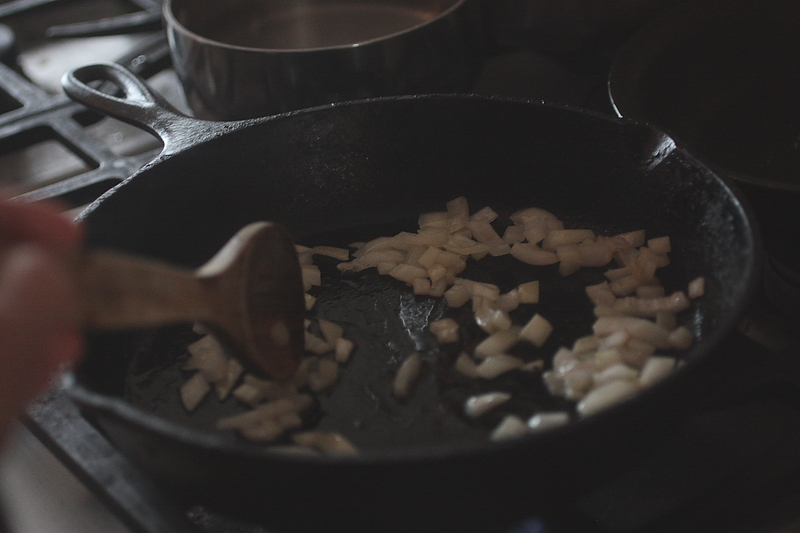 Add the diced onion and saute until translucent. Add the rutabaga and carrot and spread out into a single layer. Allow to cook, undisturbed, for 5 minutes (you want them to get good and brown on one side before stirring). After the first five minutes, check to see if they have browned sufficiently. 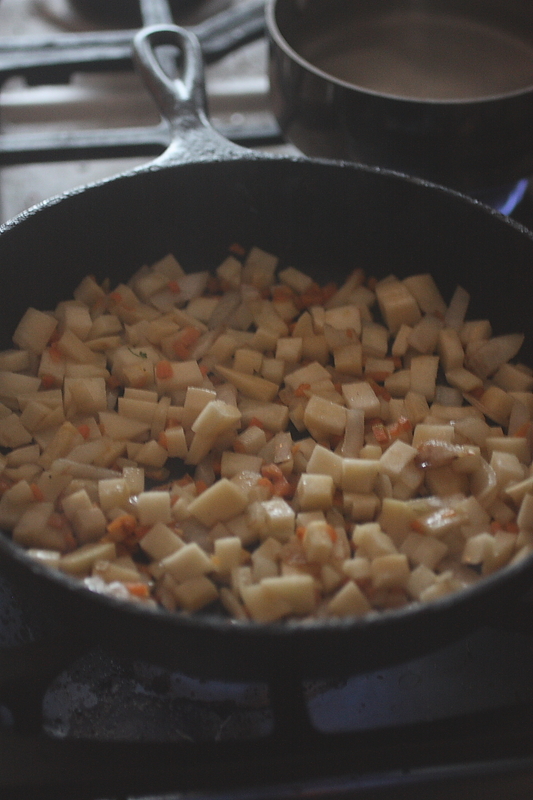 At this point, stir periodically to make sure that rutabaga pieces get brown on all sides. 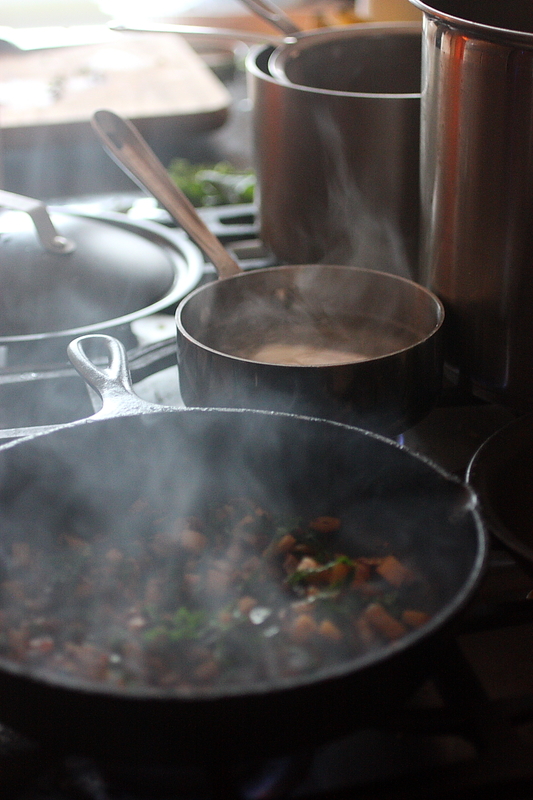 Toward the end of the cooking time, add the greens. If necessary, cover for a couple of minutes to make sure the rutabagas are cooked through. Taste for seasoning and add salt and pepper to taste. 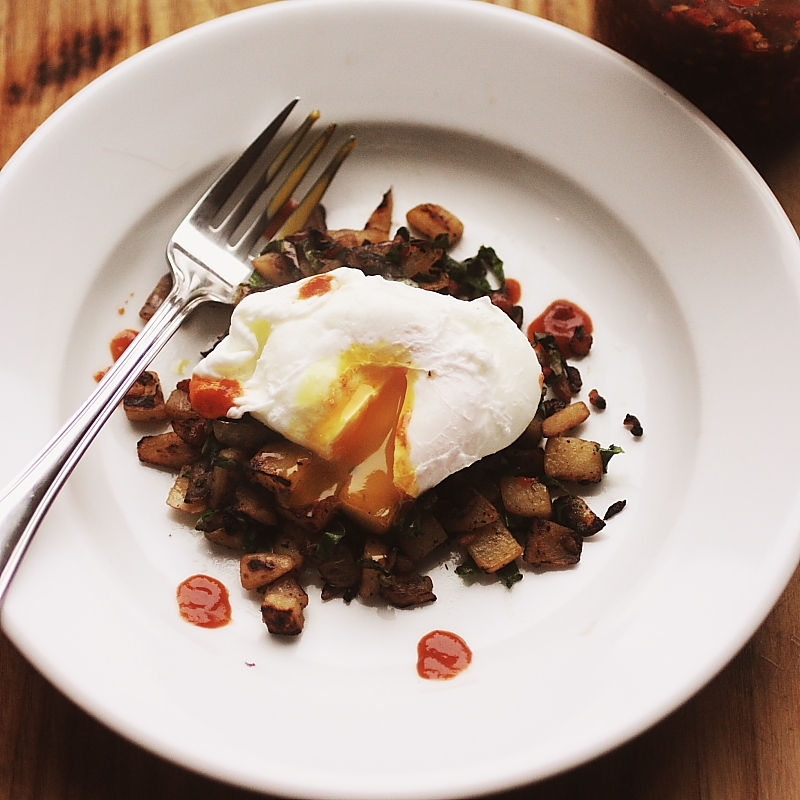 Serve topped with a poached or fried egg and a sprinkling of hot sauce. I have really enjoyed the challenge of finding creative ways to use the vegetables I’ve received from Rockin’ S Farms. I love knowing where the food comes from, who grew it and harvested it, and that I’m doing my part, however small, to support our local economy and agriculture industry. Nichelle and her family are providing a wonderful service, and we’re lucky to have access to that. Don’t forget to click over to this post and let me know your New Years Resolutions (maybe you resolved to eat more locally this year! ), or tweet the following: I want to win a $50 Whole Foods Gift card from @HFM_Alpharetta and @lifeinrecipes: http://bit.ly/AsEio7. You could win a $50 gift card to Whole Foods, courtesy of Harry’s Farmers Market.